Meet, discuss and define the problem to be solved. It is important for us to begin with a definition of the problem in terms that are constructive to creating an appropriate solution. Who will benefit and how. This discussion culminates in a brief. A framework by which the designer can approach a project, articulate boundaries, outline goals, ascertain resources, timing, budgets and plan pathways to a desirable outcome. A proposal of the project scope with a quote of associated costs and timings are presented for agreement. Understanding the problem, requires research and examination of cultural and market conditions. This leads to credible strategies and creative solutions. Concepts, prototyping, testing and refinement. The chosen concept or strategy goes on to be developed. The body of work to be completed brings together all associated applications and team members. Copy writing, photography, final artwork constructed. Final artwork is presented for final proofing and approval. The solution comes to life. 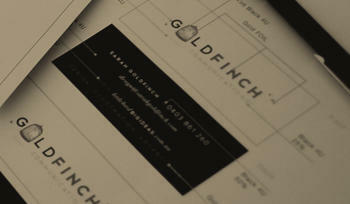 The Goldfinch studio manages and oversees the entire process through to final delivery. Advertising and marketing strategies to deliver your message. Observation, evaluation, fine-tuning and ongoing support.